Why hasn’t Shania Twain recorded anything new? Come On Over had like, a million hits on it, and I don’t even know any other albums she’s recorded. Is it perhaps because she split from music producer Mutt Lang? Hmm. Why won’t my kids eat the carrots I pack in their school lunches? They are crunchy, delicious and orange! Kinda like Cheetos, right? Plus they make you able to see in the dark! Cheetos can’t do that! Why won’t my kids throw away candy and granola bar wrappers or used tissues, and as soon as I throw out holey socks they look in the garbage and start crying? Why is this post so short? See above. I'm with you on the carrots thing. I stopped putting any sweets or fruit snacks in Leo's lunch because he would always send home the carrots or apples or applesauce. HOpe you feel better! The sniffles are going around our house as well. Why indeed? My kids would rather eat cheetos too. Not me! That's good! Cheetos and other things that make my fingers yellow are just too tempting for me. 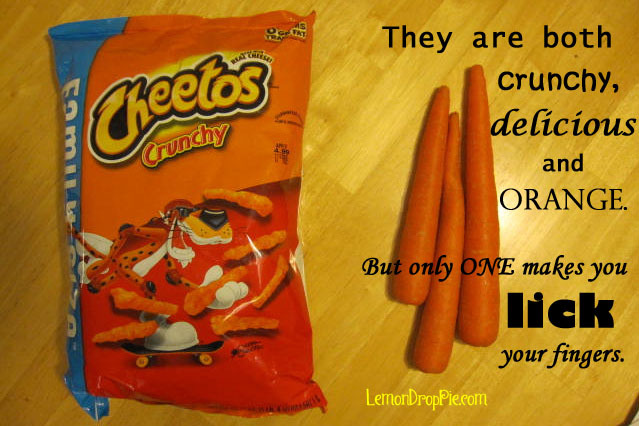 Good point on the Cheetos vs. carrots.. Making a note to myself as Cheetos are my very favorite snack! 🙂 Hope you're feeling better. – Visiting from The Spin Cycle. – Happy Monday! LOL! I agree with you..my question is why can't carrots taste like cupcakes? I would be so much thinner! I hope you are doing well my friend & getting over that cold! Oh, carrots should taste like cupcakes! That sounds fabulous to me! Oh the mysteries of why children do ANYTHING they do. I'll never understand. Fun post! Maybe the carrots are too hard and crunchy? 😉 Feel better! Yes, that's probably true! 😉 Given the choice, I think I would pick Cheetos over carrots, too! I know! Who do they think they are, anyway! Thanks for the laugh. All good questions, except maybe the Cheetos vs Carrots one 😉 Cheetos taste way better than carrots! All good questions I have considered myself… 🙂 Hope the sniffles don't keep you down long! Thank you! I seem to be feeling better tonight, so hopefully this cold is short-lived! More on the tissues thing, why does my daughter barely blow her horribly runny nose but what little she does still calls for a fresh tissue seconds later?